ST. CATHARINES – In the end, it was no skin off Freida Polihronis' back. She sought a $100,000 from the "Dragon" entrepreneurs for a 15% equity in her company. All five turned her down, but for the owner of Zoe Anti-Aging Skin Spa & Boutique on St. Paul St., the exposure was priceless. 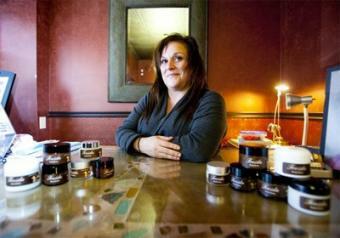 "I didn't want the money," said the exuberant Polihronis inside her St. Catharines spa. "If I got that money, then they would own me." "And I got the free advertising," she said, adding in just one day, she's had extensive media and online interest in her story. Polihronis was introduced as having an anti-aging cream and a body butter that works on skin conditions, especially eczema. To demonstrate another body polish, she applies a hand treatment on mogul Bruce Croxon, himself the founder of the Vida Spa chain out West. Ultimately, she's told the spa products market is already very crowded and her company valuation estimate is too high. At one point, the Dragons &mdash on hearing of Polihronis' Greek background &mdash exclaim "Opa!" to signify their intention not to invest. "Oh no," Polihronis replied, in a segment taped last spring. At that, Kevin O'Leary, who has a reputation as the meanie of the bunch, does a Greek folk dance with Polihronis, and consoles her as he walks her offstage. Polihronis says most revealing was a clip edited out of the broadcast: "Kevin told me 'you know, you don't need us,'" she recalled. "You are doing a great job all by yourself. You need to go home and keep doing what you're doing." The married mother of two girls said she's happy with the respectful way she was treated on Dragon's Den. "They liked my product and they liked me," she said. Polihronis adds she's satisfied her business goals are working out. From the outset four years ago, "I had a vision of what a spa should be." "I've been doing great before the show, I have the best clientele any shop owner could ever want." Currently, a spa in California carries her skin care projects and another in New Jersey is set have it. "The support I've received and interest in my products online has been overwhelming," she said. "My dream is growing even faster now." Mom Garyfalia Polihronis said she's proud of her daughter. "This is very good," the mom said with a big smile, inside the spa. "She did a good job when she was there."